Are you a Gooseberry Patch Fan? Well I am, more of a gooseberry patch junkie than a fan. I adore everything about Gooseberry Patch. Their country decor, calenders, cookbooks and their inviting charming attitude. To me Gooseberry Patch is more like an extension of my family. You see that is just how Vickie and Jo Ann make you feel when you read their blog, website, face book page and all their cookbooks. They have such a welcoming and cozy feeling about them and I just love it. 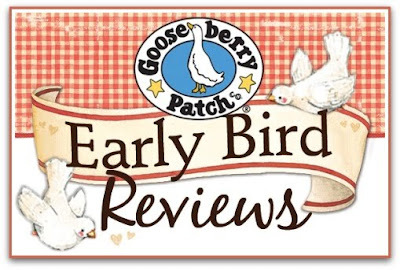 I am beyond excited to share with you that I have been picked to be one of Gooseberry Patches Early Bird Reviewers. What is a early bird reviewer you ask? Well let me explain I will receive not yet released Gooseberry Patch Cookbooks to review and share with my readers. Ike's............ I am so glad I finally got that out. It's been so hard trying to keep that cat in the bag. I am tickled pink to even be chosen and even more excited to be receiving titles from my favorite cookbooks series. So be on the lookout because today's review will be the first of many throughout 2011. And one more thing before I get on with my post. With each cookbook I review, Gooseberry Patch has been generous enough to include a second copy to be given away to one of my readers!!! How cool is that? So don't worry you will have several opportunities to win a few of these titles yourself. If you are not a gooseberry patch fan you will be as soon as you get your hands on one of their cookbooks. 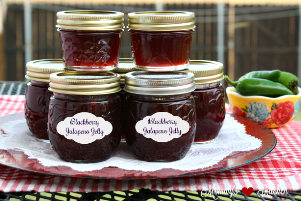 My first review is for Gooseberry Patches upcoming cookbook, Homestyle in a Hurry. When I received this cookbook in the mail the title said it all Homestyle in a Hurry. I cannot count the times that people have said to me. I can't cook from scratch because I just don't have the time to do it. Well folks with this cookbook you can. Homestyle in a Hurry is divided into 6 chapters. I know it is hard for some folks to find the time to cook a homemade meal. Especially these days because so many people are so busy in their lives. 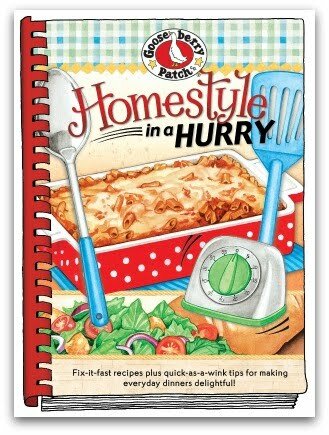 Homestyle in a hurry has over 200 yummy recipes that will take you from the kitchen to the table in a snap. Who doesn't like that? The recipes in this cookbook are so quick and easy you can make a few in just one sitting to round off a perfect meal. While I was going through this cookbook it was so hard to choose what recipes I wanted to sample. I have so many marked off with paperclips because the recipes are that good. I started off with Megan's Cinnamon Pancakes on page 13. My kiddos wanted pancakes for breakfast, so I thought I would surprise them with a different variety. This recipe called for cinnamon baking chips but I couldn't find them in the grocery store. But no worries because even without the cinnamon chips these pancakes still had a wonderful cinnamon aroma and flavor. My kids loved them and they paired perfectly with brown sugar bacon to finish off the meal. The second recipe I tried was for Mountain Momma Corn on page 124. I have made this recipe numerous times. Some people call it cream cheese corn. Whatever name you throw on it the corn is so creamy and good. 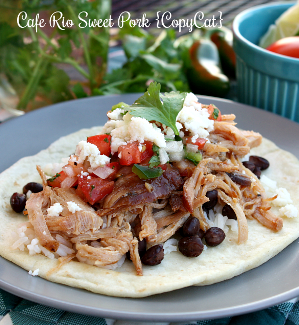 This recipe is so simple and easy and only requires three ingredients. My daughter loves corn so this is one of her favorite ways to have it. The third and final recipe I chose was for Orange Blossom Honey Butter on page 14. Yummers!!!!! 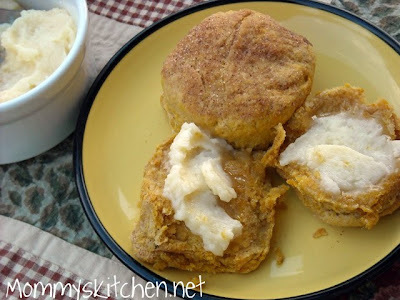 I was going to just make plain old honey butter to slather on these pumpkin biscuits, but the orange blossom honey butter was so much better. I can't wait to try this on a bunch of other breads. Well there you have it those are the recipes I chose to sample. I have a few others I am dying to try, California Omelet, Buttery Coffee Cake, Ooey-Gooey Mozzarella Sticks, Garlicky Shrimp & Pasta, Speedy Spanish Rice, Beef & Snow Peas, and Yummy Lemon Blossoms (my dd will love these) . So be on the look out for a few more recipes form this wonderful cookbook. All in all I was quite impressed with Homestyle in a Hurry. I really like that all the recipes are from home cooks just like you and me. I also love that all of the recipes in this book require only a handful of ingredients, nothing fancy schmancey or hard to find. I mean really who has time for all that. If you know of a busy mom that wants to cook great home cooked meals, but just doesn't have the time to do it. Heck maybe that person is you. I know it can be me on some occasions. If that's the case then this cookbook would be perfect. "Homestyle in a Hurry" will not be released until mid -January, but Gooseberry Patch has sent me an extra copy to share with you. If you can't wait you can also pre order a copy from amazon for $9.35 that is such an awesome price and a 45% savings. Now onto the giveaway rules. 1. Become a fan of Gooseberry Patch on Face book. When you have done that, return to this post and leave a separate comment letting me know that you are now a fan. 2. 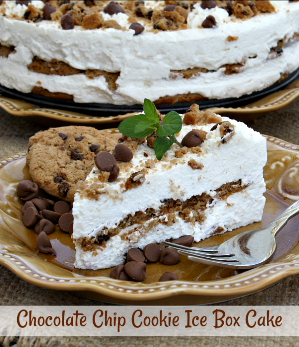 Become a Fan of Mommy's Kitchen on Face book. 3. Mention this giveaway on your face book page. Come back and tell me so. Last day to enter this giveaway will be Monday January 17Th at midnight (CST). I will pick a random winner using random.org and announce the winner on this blog, face book and twitter. Good Luck to everyone. Contest open to U.S Residents only due to shipping charges. If you leave an anonymous comment please include your email address. That way I can get in touch with you in the event that you are the winner. Disclosure: Gooseberry Patch provided me with a copy of "Homestyle in a Hurry" for the purpose of this review. They also provided me with an additional copy to use in a reader giveaway. With that being said the opinions stated above are entirely my own. I would like to thank Gooseberry Patch for choosing Mommy's Kitchen as a "Early Bird Reviewer" and for sponsoring this giveaway. I because a fan on Facebook...I took love Gooseberry Patch and have for years! I didn't know they had a FB page, so very excited. My son loves Cinnamon Chip anything, I will have to try those pancakes when I win the cookbook! I own about 10 Gooseberry Patch cookbooks and various items from their catalogs. Love Gooseberry! I would love to read one of the gooseberry patch's cookbooks..I've drooled over them for years, and never got around to buying one. I'm also a facebook fan of gooseberry patch. and I like mommy's kitchen on facebook. Well thanks to a previous FB link from you I learned about these cookbooks and just ordered the Comfort Foods Cookbook! I have Become a fan of Gooseberry Patch on Face book. I don't know any, but my mom has all of them. I'd love to start my collection with this one. 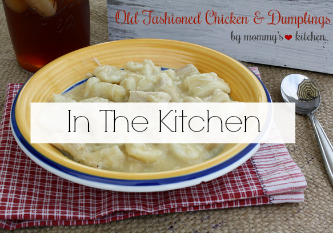 Im a Fan of Mommy's Kitchen on Facebook! I mentioned this giveaway on my face book page! I don't own any GooseBerry Patch cookbooks. I own one of their Christmas cookbooks. My mom is a big fan and gave it to me one year. I love it. It has recipes plus tips on decorating, gifts, etc. I also "like" them on Facebook. I don't know why, but I have never even heard of this. I would love it. I tweeted: Win a soon to be released @gooseberrypatch Cookbook @mommyskitchen! I have GBP's cookie cookbook. Love it. The most recent GP cookbook i have is the Keepsake Cookbook, but I have several other small ones. I am a GP fan on Facebook. I'm not sure how I've never heard of Gooseberry Patch before, but I'm so glad you've made me aware their amazing products! I've spent the last 30 minutes reading their blog and looking at the cookbooks. PS. Tried searching for the pumpkin biscuits you showed here, but no luck. Are they here on the site? Also became a fan of Gooseberry Patch on Facebook. ...and a fan of Mommy's Kitchen on Facebook. ... and also became a Google follower! i have Meals in Minutes and i gave my daughter Fall Recipe's. Love Gooseberry Patch! I own almost all of Gooseberry Patch's cookbook. I have been a fan of the for years! 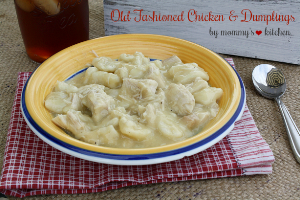 I have Old Fashioned Country Christmas, Quick & Easy family favorites, 5 Ingredients or Less and new for Christmas I got Fast Fix Meals. I love Gooseberry Patch. I just befriended Gooseberry Patch on Facebook. I own about 10 GBP cookbooks! I love them! I own two Gooseberry Patch cookbooks. Became a new google follower today. I am a fan of GBP on FB! I don't own any, yet. Already a fan of Gooseberry Patch on FB. I like GBP & Your Facebook page! Already a fan of Mommy's Kitchen on FB. I do not own any of these cookbooks, but I'd love to have one. No - I don't own a Gooseberry Patch cookbook, but I think I should. Sounds like all the best recipes from church cookbooks rolled into one. 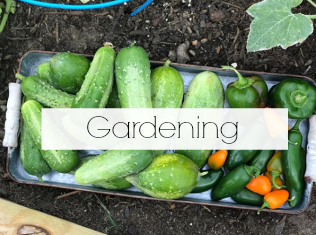 Liked Gooseberry Patch on FB. I own a couple Gooseberry Patch cookbooks. What a great giveaway! I love GBP cookbooks...I have a couple of them and I always give them as a wedding gift. I would love to have this one! Thanks for the chance! Never heard of GBP until coming across your blog and I cant wait to get some of their cookbooks. I became fan on their facebook page. I own a couple and have been very happy with them. This one sounds like a winner as well. The corn sounds delicious! 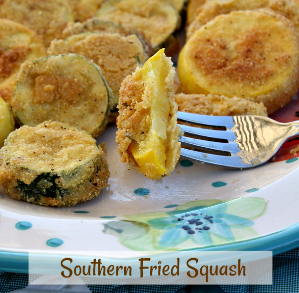 Always looking for different side dish recipes that are simple. I don't have any of their cookbooks, but would love to try one. I am a Gooseberry Patch fan on FB. And last, I Follow you on Google as well. Thanks for hosting this giveaway! I love cookbooks. I have 4 of their cookbooks already and just love them. I can't wait until this one comes out, or hopefully I win one. I don't have any of their cookbooks, I've checked a few out from the library and LOVE them. I got 3 GP books for Christmas this year. They are excellent! I've never read any Goosebery Patch cookbooks, but from the recipes you posted, I'm sure to love them. I don't have any of their cookbooks but would love to have one! thanks for the chance to win. I have never seen a Gooseberry Patch cookbook, but the recipes your showed look wonderful!!! I own 6. Wish I owned them all, as I am a non -contrite cookbook junkie. I've looked at GB stuff a few times, and would love to have one of my own! I do not own any of the cookbooks, but eyeball them over at amazon all the time. :) Would love to give one a try. I am already a fan of your facebook page, and follow ya! I have two GP cookbooks and a recipe in each of them! Its just a thrill to pick one up in a store and find my recipe! I also order their other merchandise...its great stuff! I am already a FB fan of Gooseberry Patch and Mommy's Kitchen, does that count? I'm a Facebook fan of Mommy's Kitchen!! I'm also a fan of Gooseberry on Facebook! I hate to say I do not own a Gooseberry cookbook...but I would love to own one! My first Gooseberry Cookbook was Old Fashioned Christmas Cookies. The rest is history. I too am a "junkie"! I even have a recipe in one of the Christmas cookbooks. There are very few of their cookbooks that I don't have. I am already a fan of theirs on FB. Great review!! I too love Gooseberry Patch!!! Can't wait to try out their new cookbook. Hopefully I will win this cookbook! I have been a Facebook fan of Goosebery Patch for sometime. Love them! I too am a facebook fan of Mommy's Kitchen. Can't get enough of Mommy's Kitchen! I have been following your blog through Google Reader for quite sometime. Love having all of my blogs to read in one place! I receive your blog posts via email. I do not own Gooseberry Patch cookbooks! 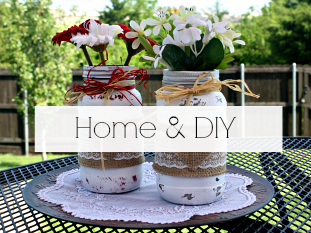 I am a fan of Gooseberry Patch on Facebook! Thrilled to be a Gooseberry Patch follower on FB. Already a FB fan of your page. Already receive RRS Google updates from you :). Posted giveaway on my FB page. Have never tried Gooseberry-patch...always looking for meals in hurry. Became a fan on fb of yours and gooseberry patch. I have recently found gooseberry patch through your blog. I do not own any books yet but can't wait to find one and try it out! This one sounds perfect because we are always in a hurry! Thank you!! I like Mommy's Kitchen on Facebook also! I do not have a Gooseberry Patch cookbook....YET! 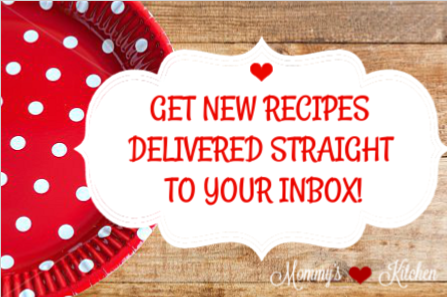 These recipes sound so yummy that I think I might have to get one! I don't have any of their cookbooks...yet! But this one looks great! I LOVE Gooseberry Patch! I just posted an awesome Gooseberry Patch Flaky Chicken Pot Pie recipe last week that was DE-LISH!!! I have one Gooseberry patch cookbook and love it! 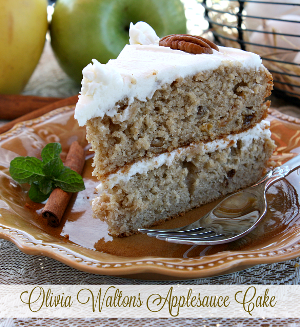 I have the family favorite recipes one but would enjoy another one!! I have 16 Gooseberry Patch cookbooks and I use each and every one! I am a Facebook fan of Gooseberry Patch! I have never heard of them before you blogged about them. Just reading what you have tested makes me hungry! 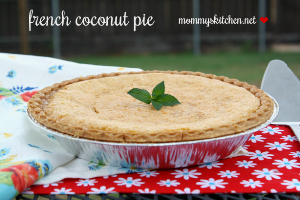 I am a Facebook fan of Mommy's Kitchen! I am a follower/Google reader. I am posting about this giveaway on Facebook. I had never heard of Gooseberry Patch until just now. I would love to try out the new cookbook, too, though! I'm also now a fan of Mommy's Kitchen on facebook. I added Goose berry patch to my likes. I also have to say, I own all their books !!!! I don't own any but I have seen many of their recipes that look yummy. I do not own any gooseberry cookbooks because I have never heard of them until now. I love cookbooks and would love to win! I'd love a chance to win GP cookbook, I'm a collector. I already am a follower of GP and you on facebook. I do not own any Gooseberry Patch cookbooks. I love cookbooks and would love to win. Unfortunately, I do not have any of the cookbooks. I know they are wonderful! i don't own any cookbooks yet by them but i would love to! Oh Yes I have several Gooseberry Patch cookbooks, most of them are Christmas ones!!! I am a fan of Gooseberry Patch on facebook!! I have the Christmas Gooseberry Book...LOVE it!! I do not own any Gooseberry Patch cookbooks, but would love for this to be my first! I am now a fan of Gooeberry Patch on Facebook. Yes, I have several of the Gooseberry Patch cookbooks, as well as some other items. While I don't have any Gooseberry patch cookbooks I am familiar with them. They are really great cookbooks and I would love the chance to win one. I have Mommy's Kitchen bookmarked on my computer. i have a few gooseberry patch books and love them! I don't but it looks good! I dont own any GBP cookbooks but would love to have one!! I'm a fan of GBP on Facebook, and among their "Circle of Friends" now. I hadn't heard about GBP until your email. Just from cursory look, I think I will like them a lot! Thanks for the chance at one of their cookbooks! Hey Tina! I posted this giveaway on my facebook page for you! I have none of these cookbooks because I had never even heard of Gooseberry Patch until reading your blog. Thanks for the giveaway! I can't wait to win or to buy one of these, the recipies look wonderful!!! I have many Gooseberry cookbooks and love them all. I own 4 seasonal Gooseberry cookbooks that I bring out when a new season starts. Sorry to say...I've never heard of this collection of cookbooks...but I will be checking them out in the near future. The cookbook you are reviewing sounds like just the book for me. It's hard for me to stand for extended periods of time at the stove cooking. I looked at and printed out the recipes you've reviewed so far. They look simple and they sound delicious. 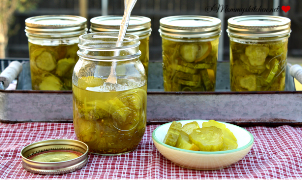 I DO have a Gooseberry cookbook, "Homemade Harvest", and LOVE it! I am a fan of Gooseberry Patch, who wouldn't be? I've been a fan of yours Tina at "Mommy's Kitchen" for about a year now...always my "go to" in a time of being stuck on something new, simple and always a WINNER! I have several of the GP cookbooks and even got one free because they printed a recipe I sent in! I'm a big Gooseberry Patch fan. I have a couple of their cookbooks that I use all the time. Unfortunately my husband and I are both unemployed and I'm not able to splurge on their new one, so hopefully I'll be lucky enough to win. i have a gooseberry special magazine from christmas 2009. I have two Gooseberry Cookbooks. They are great. I love the little drawings inside. I have a recipe in one of the Christmas cookbooks. I'm also a fan on Facebook where I shared this great giveaway and I'm a fan of yours there too! I LOVE Gooseberry Patch, years ago I contacted them to see how they started their business and they sent me a package with a ton of information! To this day, I still have it and I love to read it...it's such a wonderful story. You can't go wrong with their products or their cookbooks! Sad to say, I don't yet own a Gooseberry Patch cookbook, but everywhere I see them, I look at them. This one would be an excellent "first"! I'm now a fan of Gooseberry Patch on FB. I am a fan of them on facebook and you, i am a follower too! I posted on my page too! I dont have any of there cookbooks and have been wanting to try them!! I don't have any Gooseberry Patch cookbooks. Until I started reading Mommy's Kitchen I had never heard of them. I guess I have been deprived!! I love cookbooks and trying new recipes and taking photos of my successful kitchen adventures. I have 3 different Christmas Books and love the neat ideas and recipes in them. I also have their Welcome Home for the Holiday and the Holidays at Home cookbooks. Love them . I do not own any Gooseberry Patch cookbooks but I've heard awesome things about them! I love Gooseberry Patch cookbooks! I have the Farmer's Market Favorites! Sorry to post as anonymous..wasn't able to do it one of the other ways! I have a casserole book of theirs. I don't own any Gooseberry Patch cookbooks...this one sounds perfect for me! 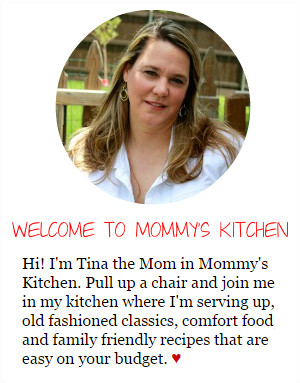 I am a Mommy's Kitchen fan on FB! I'm a fan of Gooseberry Patch on Facebook and also own several of their cookbooks. I even have one of my recipes in one of their books! I would love to win this one as well! I don't own any of their cookbooks, but I LOVE them!